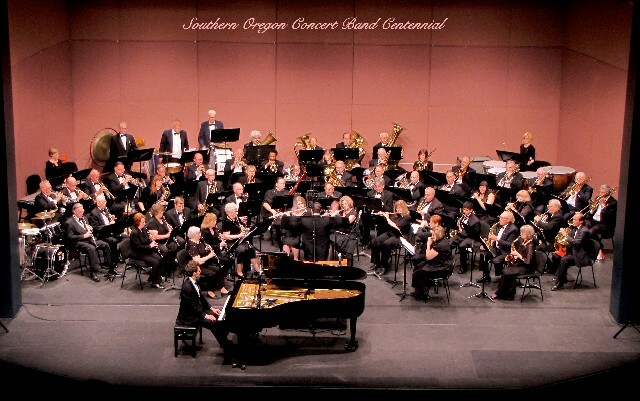 The Ashland-based, Southern Oregon Concert Band, conducted by Martin Behnke, will present its last concert of the season on Thursday, May 24th, 7 PM, in the SOU Recital Hall, 405 Mountain Avenue. This concert will feature, as soloists, some of the band’s most talented musicians playing a variety of musical genres. Trumpeter Harry Kannasto, a fixture in the local music scene for over 50 years, will perform the lively ‘Honeysuckle Polka’. Flautist Jennifer Behnke is featured in Claude Bolling’s ‘Baroque and Blue’ from ‘Suite for Flute and Jazz Piano’. Clarinetist Gwen Hutchings solos in Artie Shaw’s ‘Concerto for Clarinet’, and oboist Hans Lindner will perform his original composition ‘Notturno’ for Wind Ensemble. In addition, the band will perform an original work by conductor Martin Behnke, ‘Canticle of the Sun’, ‘The Purple Pageant’ by K.L. King, Warren Barker’s ‘Broadway Show Stoppers Overture’, John Philip Sousa’s ‘The Black Horse Troop’, and ‘Puszta’ by Jan Van der Roost, conducted by SOCB saxophonist David Sommers. The Southern Oregon Concert Band is a 60 piece brass and woodwind community band composed of players ranging in age from students to senior citizens, enjoying its 103rd year entertaining the residents of the Rogue Valley. Admission to the concert is a suggested donation of $5. For more information on the band, visit our website at www.socband.org.